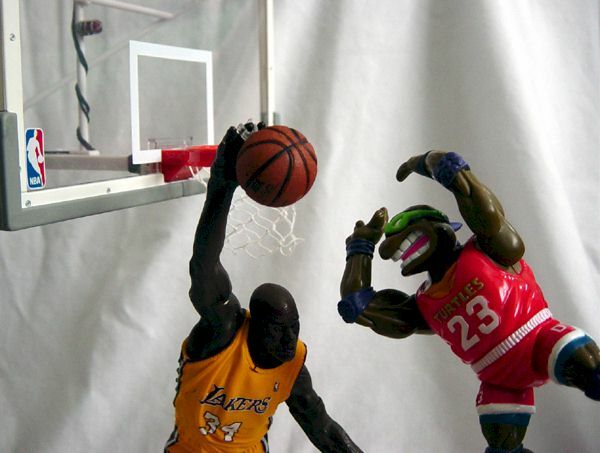 Coheteboy comes up with a double slam jam tonight - the newest Shaq figure from McFarlane Toys, along with the special Backboard. Take it away! It's been a long time coming since the beginning of McFarlane Toys with the original line of Spawn action figures. Looking back at those, it's unbelievable how far they've come in the level of detail, sculpting, paint applications, and shere variety of lines. Think of any property, McFarlane has had a hand in it all, from comics to rock stars, from action films to horror films. One of the more popular of McFarlane's line-up is the McFarlane's SportsPicks that include MLB, NFL, NHL, and the NBA. There are a lot more sports heroes being created for upcoming assortments so if you don't see your favorite player, just be patient as they will probably be made shortly. The NBA line has recently released Series 2 that includes NINE players: Ray Allen, Elton Brand, Kwame Brown, Steve Francis, Antawn Jamison, Tracy McGrady, Dirk Nowitzki, John Stockton, and Shaquille O'Neal. 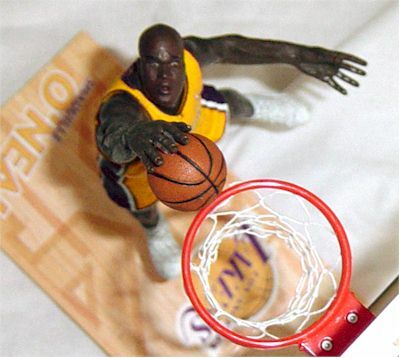 I picked up the Shaq figure along with the NBA Backboard for no particular reason other than that these are pretty darn neat. Of course, living in the Los Angeles area kinda helps. 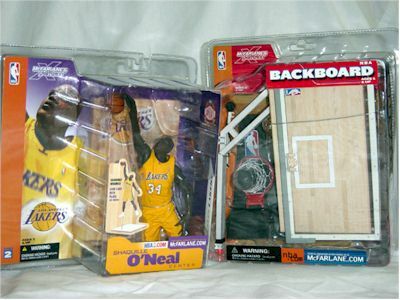 Packaging for both Shaq and the NBA Backboard here are virtually identical to just about every other McFarlane figure on the shelf these days, packed within a plastic clamshell bubble. What's good about this style is that it's clear on all sides and allows for colorful art inserted on the inside, which is actually rather unique. The downside of course, is not being able to put the figure back inside the case after opening. But... nobody does that anyway right? 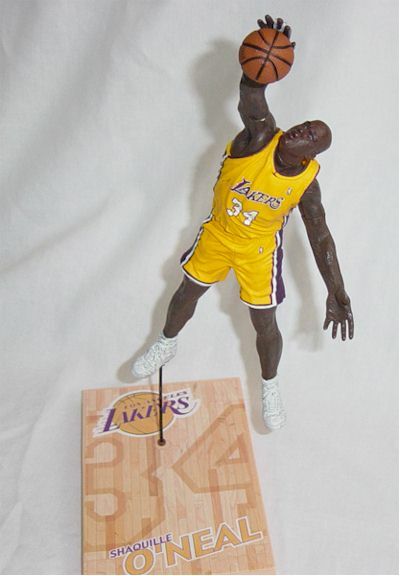 It's as if Shaquille O'Neal was frozen in time and shrunk down to size, the sculptors at McFarlane captured the likeness terrifically. There are little details in the sculpted fabric that is stunning. Why bother with porcelain statues if you can get this much detail in plastic? Even the shoelaces on the sneakers are well sculpted. It's all there. Just like the great work in sculpting, the same applies to the paint application. Everything is crisp and precise where it needs to be (lettering on the jersey) and well... it's even pretty exact on the shoes as well. There are a few minor misses when the socks bleed into the legs but that might vary on each one. Everyone knows that articulation doesn't come with the territory in their figures so it's pretty much expected that there be very few points. Shaq has articulation in the neck, rotation at the biceps, and rotation at the thigh, adding up to 5 all together. Isn't bad really, but it would always be nice to change the pose once in a while. 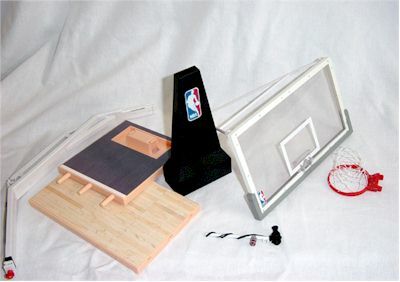 Each NBA figure comes with an NBA basketball and their own custom base. The ball is a tad smaller than it should be but it isn't too big of a deal. 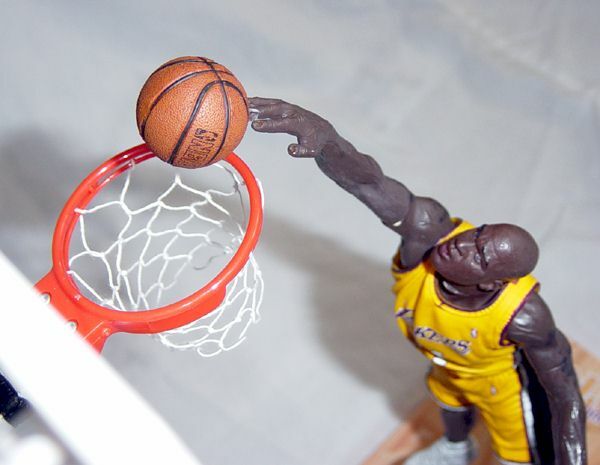 The ball has a clip inserted into the ball to allow it to attach at Shaq's fingertips. 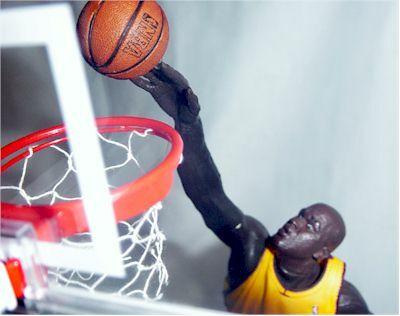 As you'd expect from McFarlane, the ball does have NBA painted on to add to the authenticity of the toy. The base is great as it has the name of the player, the team logo, and jersey number. The base also connects to the backboard. Depending on which store you purchase these, you can add a half or take one away, so shop around before you commit. For the level of detail, McFarlane toys are always a very good buy. The SportsPicks vary from store to store going from as low as $9.96 (Wal-Marts, Targets) to as much as $12.99 (Electronics Boutique, etc). 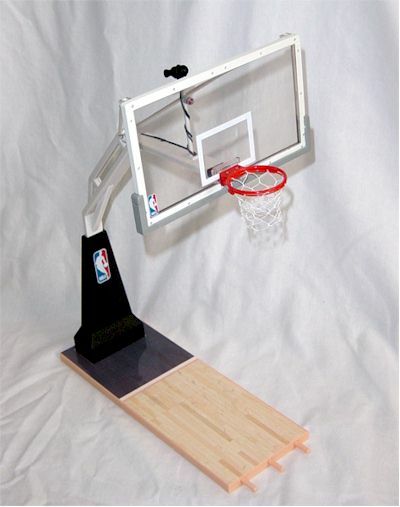 The NBA Backboard is a spawn.com exclusive going for a low $12 which is actually a terrific value for the size and level of detail. Overall, the NBA line is a great way to show off your appreciation for a team or a player, whatever you choose. The level of detail is always incredible and looks fantastic on display. 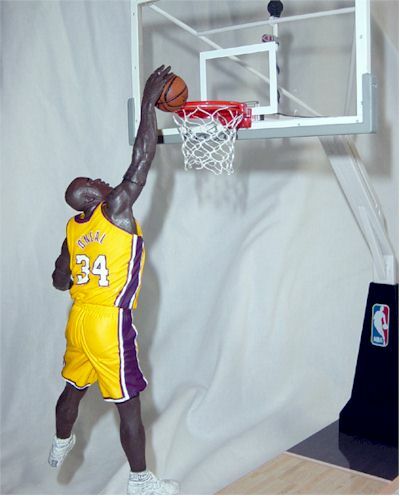 Love him or hate him, Shaq makes for a great figure. This is a must for fans of Kazaam, Crunch Bars, Burger King, and Radio Shack. Of course fans of the LA Lakers will want to pick this one up too. The NBA Backboard is perfection. You won't find a better accessory anywhere. Of course, purists would probably love for McFarlane to make a full court to scale, but collectors with less space can be happy with this impressive piece. 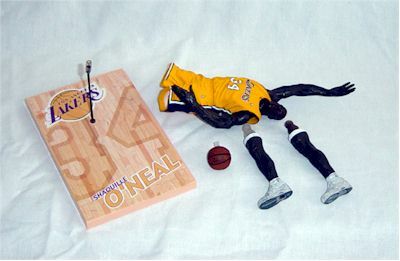 - Aislesniper has Shaq and the rest of the series in stock for $10.99 each. The collector store at www.spawn.com is the only place to pick up the NBA Backboard at $12 (and a bit more for shipping) and is currently out of stock. According to the site, more will be available in March 2003 so make sure you join the Collector Club. But if you just can't wait, check out your local comic book and toy specialty stores and see if they have it at a good price. I was able to get mine for $20 (not bad since it would be close to $18 through www.spawn.com after shipping) at a local toy show.